Stir-frying is a quick and healthy way to get dinner on the table on a busy weeknight but delicious enough to serve at a gathering with friends. From a warming stir-fried beef with onions to beef with Chinese green beans, there are plenty of recipes to choose from to please the whole family. 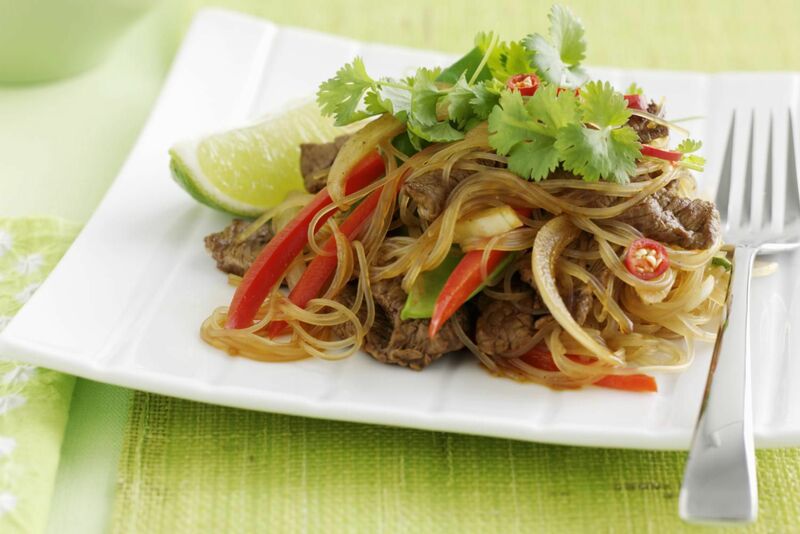 Before you start cooking, however, you may want to brush up on a few tips when it comes to stir-frying—specifically, stir-frying beef. For example, making sure your wok is hot enough and freezing the meat beforehand to make it easier to slice thinly. This recipe is a quintessential menu item at many Chinese restaurants. The oyster sauce is a main ingredient in the sauce and enhances the natural flavor of the beef nicely. After a quick marinade in a soy sauce and rice wine mixture, the meat is stir-fried in ginger and then combined with carrots and mushrooms, along with the oyster sauce, brown sugar, and chicken broth, making for a tasty and quick dinner. Beef is paired with Szechuan-style dry-fried green beans in this quick and easy stir-fry. If you can find them, use Chinese green beans instead of regular green beans; they are much longer (they are also called long beans because of this), and will create a more authentic dish. A flavorful combination of garlic, ginger, scallions, chilies, soy sauce, and sugar make this beef stir-fry dish a winner. Fermented black beans lend a savory flavor to this recipe, while chili paste adds a bit of spice. Sliced beef is first marinated and then cooked with carrots, celery, and scallions along with the fermented beans that have been mashed with garlic. The recipe is rounded out with a tasty sauce and finished with a drizzle of sesame oil. The secrets to this recipe are marinating the beef for a half an hour and cooking the broccoli in water ahead of time. The marinade of egg white, potato starch, rice wine, soy sauce, oyster sauce, and sugar impart rich flavor while tenderizing the meat, and blanching the broccoli results in their being soft inside after only a short time in the wok. Although this may not sound like the most exciting dish, when all of the flavors come together it is quite impressive. Marinated beef is combined with onion and then finished with a flavorful but simple sauce consisting of dark soy sauce, sherry, and sugar. Chopped spring onions add the final touch. This colorful beef and vegetable stir-fry features red and green bell peppers along with mung bean sprouts, a common Asian ingredient that adds a slightly nutty taste and crisp texture to the dish. The beef is first marinated in a honey and soy mixture, and then is stir-fried with garlic and ginger, the vegetables, and oyster sauce, and topped with toasted sesame seeds. In Chinese culture, the number three symbolizes luck, so this dish is considered lucky—and, lucky for us, it is as delicious as it is easy to make. Like most stir-fries, the recipe begins with marinating the meat before cooking along with vegetables, which consist of bok choy, mushrooms, and red onion in this case, and then finishing with a flavorful sauce of dark soy and sherry. A great stir-fry recipe to make during the week, this dish will satisfy even the hungriest eaters as there is a generous amount of beef. The bamboo shoots, bell pepper, and green onions make this an attractive dish while providing satisfying texture. If you have never eaten bamboo shoots before, you are in for a treat; they offer a nice crunch and are very good for you!